Fly Casino review. New playtech casino. 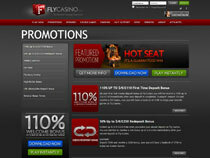 CasinoBonusNews → Casinos → "Fly Casino review"
Fly Casino is a new online casino that is making a big name for itself. Of course it helps that they are a the sister casino to one of the oldest and most respected joints on the block, Omni Casino. In this review of Fly Casino you will see why it has got such a following already, and discover the vast array of high quality games at your disposal here. The software at Fly Casino is top of the line. It is powered by the top notch Playtech Casinos, which as you may or may not know, have a very good reputation built over a large number of years. Whether it’s table games or slots that you like, there is an abundance of both at Fly Casino. One of the best things about this site’s software is the realism. Both the smooth gameplay as well as realistic graphics and sounds add to the gaming experience known at Fly Casino. Check it out for yourself, you will surely be impressed. Now lets look at the extensive games list at Fly Casino. When it comes to slot machines, Fly Casino has some of the top branded (comics, movies, TV, etc.) anywhere on the internet. They have titles such as Thor, Iron Man 2, Iron Man 3, Captain America, etc. That is on top of 100’s of other selections as well. If you are more a fan of table games, no worries – there are a ton. With the usual suspects at Blackjack and Roulette (both multiple variations of each), there are also Caribbean Stud Poker, Casino Hold’em, Casino War, Craps, Pai Gow Poker, Red Dog, Sic Bo, Tequila Poker and more. In addition, you will find multiple Scratch cards, Keno and Arcade Games, Video Poker and more. 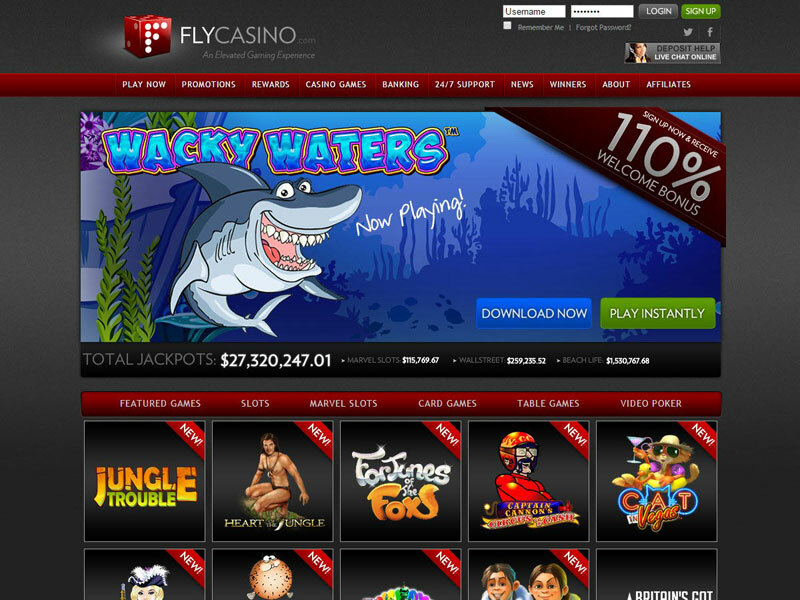 There truly is an endless selection of real money casino games at FlyCasino.com. Unfortunately, like all other Playtech powered casinos, FlyCasino.com does not accept customers from the United States. Therefore if you are an American you will have to refer to one of our US-Friendly online casinos instead. In this next part of the review, we are going to take a look at the different bonus offers available to you. Firstly, you get a 110% UP TO $/€/?110 first time real money deposit bonus which is pretty generous indeed. 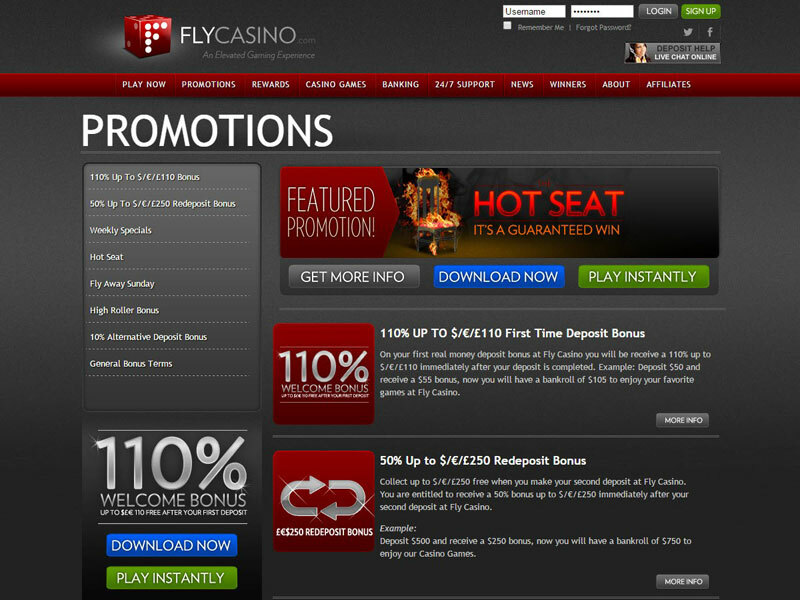 This particular promotion is only for new players to FlyCasino. They won’t forget about you after that, however, as you will also get a $/€/?250 max bonus worth 50% of your redeposit as well. So not only do you get a 110% as a first time customer, when you decide to make another deposit you will collect on a 50% bonus as well! And as if that weren’t incentive enough, they additionally offer you a 3rd time deposit bonus, so the good times keep rolling on at Fly Casino. Lets take a quick peak at the different banking options available to you at FlyCasino. You can use Visa, Visa Electron, Neteller, Switch, Solo, Maestro, Neteller, InstaDebit, WebMoney, Skrill, Click2Pay, MyCitadelWallet, DinersClubInternational, WireCard, Bank Transfer, Envoy, Ukash, PaySafeCard, Entropay, Poli, Giropay, Usemybank, Internet anking, iDeal, Ebanka, Przeleway24, EPS and many more. As you can see there are endless options for you to both deposit your money and cash it out at Fly Casino. They have one of the most extensive list of banking options out of any online casino, another reason for their early popularity. Without a doubt, FlyCasino is also well known for their great customer support. They’re helpful and knowledgeable, and speak a variety of languages in case English is not your first language. Not only can you reach player’s help 24/7 via e-mail, you can also use phone, fax or live chat as well, so they have all their bases covered in the support department for sure. In this Fly Casino review you saw how amazing this online real money casino is, and why people have been flocking to it like crazy. With a huge deposit bonus as well as 2nd and 3rd bonuses, the incentive is definitely there to join Fly Casino today, while the offer is still active! A 110% welcome deposit bonus is waiting for you with your name on it, good luck.